ANd congrats to you, K-KAT! E tu, Q! Buona Pasqua a tu! How did you know that I was studying Italian?! gigglols “Studying” in the most liberal of the definitions, that is. ‘snot much, Roofie, how ’bout you? It am tew urlie tew bee up owt wesht. Happee Eester ebreewun! 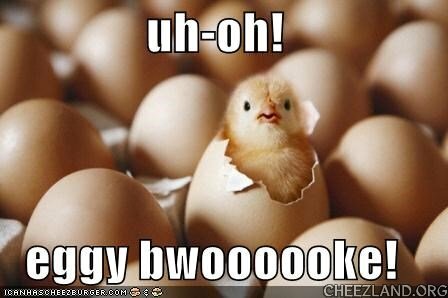 Glad tew see dis lil chickie got up hiz kourage an kaim owt uv hiz shell!